Two Most Valuable Player candidates met head to head Thursday night, and one was surrounded by a far better supporting cast. That wasn't LeBron James, whose Cleveland Cavaliers were missing more post men than a striking mail delivery service. Kevin Love, Tristan Thompson and Larry Nance Jr. were all injured and unable to perform, which meant the Cavaliers were forced to play small and smaller. 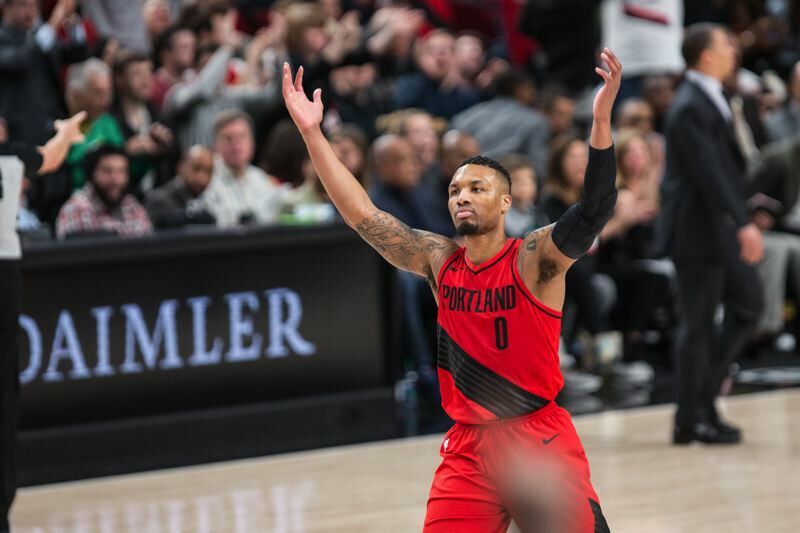 Forward Jeff Green played center and guard Rodney Hood played forward, and the Trail Blazers took advantage in a 113-105 win Thursday night at Moda Center over the team that has represented the Eastern Conference in the NBA Finals in each of the past three seasons. Portland (42-26) ran its win streak to 11 games and solidified its hold on third place in the Western Conference playoff race. A superstitious Terry Stotts, the Blazers' coach, didn't want to touch the "M" word. "I don't know about momentum," Stotts said, "but we're playing well, and each game is a challenge. To string together the wins we have, we've been doing good things at both ends of the floor. Tonight was an example of that." Damian Lillard heard "MVP!" chants while at the free-throw line in the closing seconds, even on a night when the reigning Western Conference Player of the Week was missing his shooting touch. 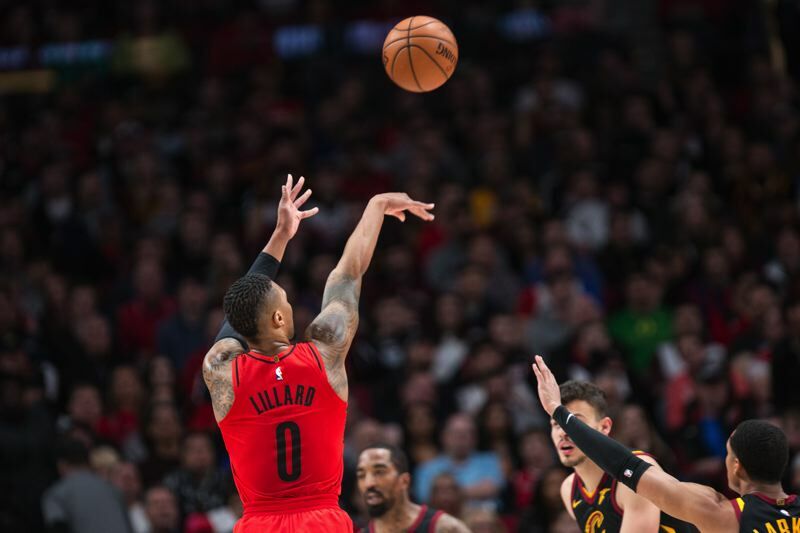 Lillard finished with 24 points and nine assists in 36 minutes but made only 7 of 20 shots from the field, including 1 of 8 from 3-point range. Lillard got plenty of scoring help from backcourt mate CJ McCollum, who poured in 29 points on 12-for-24 shooting. The Blazers also got major contributions from forwards Moe Harkless (17 points), Evan Turner (11 points to go with seven rebounds and five assists off the bench) and Al-Farouq Aminu (11 points, nine boards) in what truly qualified as a team win. James was sensational in his annual visit to Nike Town, collecting 35 points on 15-for-25 shooting to go with 14 rebounds, six assists, three blocked shots and two steals in 41 minutes. He was forced to carry too heavy a load, however, with six of Cleveland's 11 turnovers as evidence. Portland used Aminu, Harkless and Turner at various times to defend James. "We did a good job on LeBron," Stotts said. "The guys made him work for tough shots. He's such an outstanding player and a handful in transition. We forced him to make tough shots, and he did." Portland annihilated Cleveland 50-34 on the boards, including 13-2 off the offensive glass. "We're shorthanded, and (the Blazers) took advantage of our size," James said. "We played good defense for 24 seconds, but with a team like this that has been playing so well, you can't give them second-chance points." Lillard wasn't willing to concede the Cavs were outmanned. "They have some guys out, but they still have LeBron James," he said. "Having a small lineup out there presents a problem. It's not the typical defensive coverages you play against. They were switching everything. they're athletic and agile enough to trap and junk the game up, and they did a good job of that at the start. "But our ball movement was on point. We were able to build a lead. But any time you have him out there and a bunch of athletes around him, you have a game on your hands." The Blazers led the Cavaliers (39-29) by a 59-54 count at halftime, then used a 16-4 spurt to push ahead 81-66 late in the third quarter. Portland's lead was 101-86 after a Shabazz Napier 3 with 7:37 remaining, but the Cavaliers stormed back, using a 16-4 run to draw within 105-102 with 2:58 remaining. Then Aminu sank a 3, Turner converted a floater and the Blazers' edge was 110-102. After James blew a driving layup, Lillard sank three straight free throws with 28.8 ticks left for a 113-105 lead, and it was over. "We played a solid game," Lillard said. "It was another one of those games where you know (the opponent) is going to make a run. We cut it really close, but you can't complain about how you get it. We got another one." It was another game, too, where the opponent came from far back, but the Blazers had an answer. That wasn't happening early in the season, when hey lost 10 of their first 17 games at home. "We've gotten better with experience," Lillard said. "In the past, it might have been myself and CJ feeling like we had to do things instead of making a play and trusting the next guy. We have guys getting us extra possessions, flying around. Down the stretch, it's much more of a collective effort than us having to have a big-time performance." Portland has won 17 of its last 18 outings at home. Lillard credits the fans with an assist. "Our crowd has always been there," he said. "Even the games we struggle, they bring the energy. But when we have success, they go to another level. It gives them something to be excited about when we play quality basketball. We're using the energy of our crowd and the fact that we're the home team to our advantage. "t's a different vibe when you're playing well and the crowd is into it. It's like every single thing that we do is a bigger deal than on any another night." It was that kind of night Thursday, with James in the house. Saturday night, the Blazers will have an opportunity for another home win, and to extend their streak to an even dozen, against the 30-38 Detroit Pistons. "We're taking it game by game," forward Ed Davis said. "We need every win we can get to gain homecourt advantage in the playoffs. We protected homecourt and handled business tonight. Now we have to do it again Saturday versus Detroit." NOTES — Portland's streak matches the longest during Stotts' six years at the helm, originally accomplished in November 2013. ... The Blazers have won five consecutive games at home against the Cavaliers. ... Lillard became the third player in NBA history with at least 1,500 points and 400 assists in each of his first seasons, joining James and Oscar Robertson. ... At Cleveland's shootaround, James was asked about Lillard. "The guy is a superstar in our league," he said. "He's showing it right now, leading his team where I don't think a lot of people thought they'd be at the beginning of the season." Is Lillard underappreciated? "He uses that," James said, "but if you're a true basketball mind who understands the game like me — give me Damian Lillard. I'll show you how appreciated he'd be."